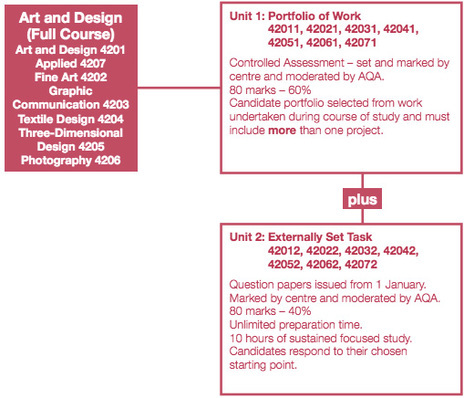 This example of a course overview from the AQA specification shows the typical division of Units (Unit 1: Portfolio, Unit 2: Externally Set Task) and % weighting of marks available (60:40). NB. Short course versions of these specifications are available. There is very little to choose between these specifications. Each requires students to create a Portfolio of work for Unit 1 and begin the Externally Set Task for Unit 2 beginning in January of the year of examination. The only slight difference is in the stimulus material provided by each exam board. For example, AQA provide a choice of 7 themes from which candidates must choose one. These are specific to each endorsement. WJEC provide 21 starting points that mix words and images for all their endorsements as do OCR who provide a mixture of 10 written and image based starting points. 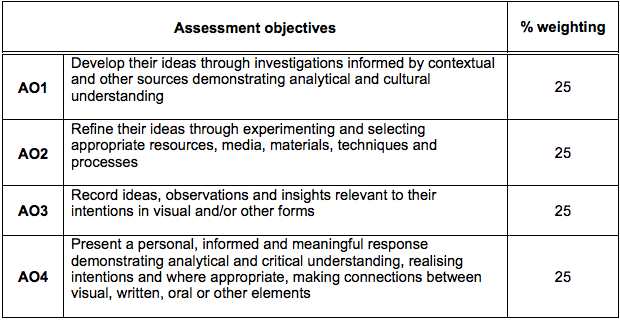 Edexcel provide one over-arching theme which is then presented as a number of sub-themes. In each case, Units 1 and 2 are marked by the centre and moderated by an external examiner.